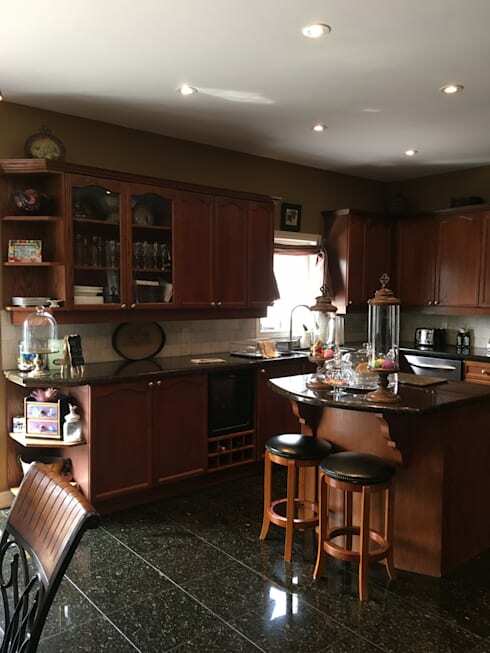 This kitchen was once cozy and kitschy, with most surfaces covered in dark wooden cabinetry that gave the space a luxurious feel, coupled with a tired, dimming effect. Somewhere along the lines of Southwestern meets elegant farmhouse, this kitchen was once a dream (probably at some point in the early 90s), but compared to the fresh, crisp, and sunny kitchens of today, this one offered a distinctly demotivating atmosphere. 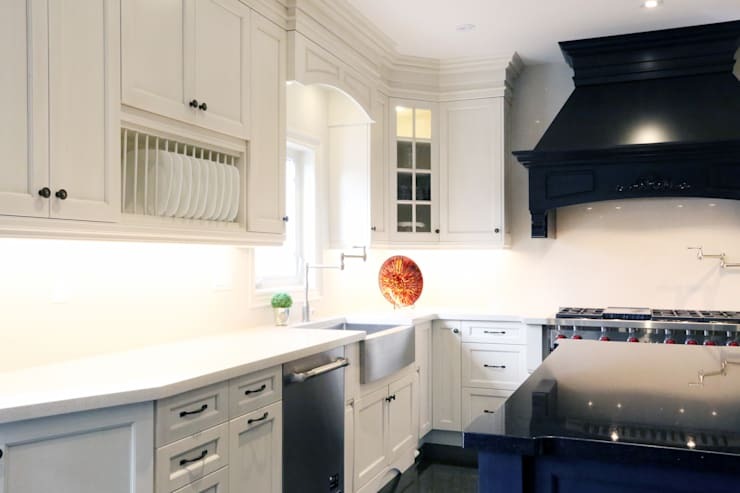 Specializing in cabinetry, the designers at Tango Design Studio stepped in to create a new kitchen with better use of space and an emphasis on light, turning what was once demotivating into a fresh and inspiring kitchen fit for a modern family lifestyle! 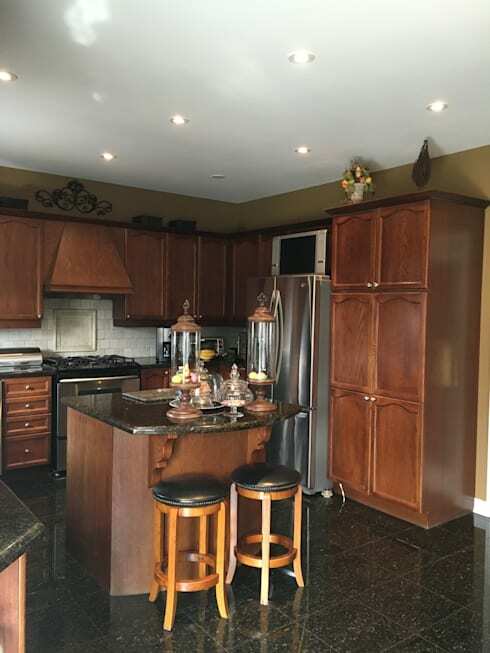 It’s hard to see the kitchen through all the clutter – the cabinets seem to hide in the shadows in their dark, wenge-y shade. Elaborate detailing in the wall decor, lamp, chairs, and and decorative stands attempt to create an elegant atmosphere, but their beauty is weighed down by a dim, cluttered environment. Lights cover the ceiling, but somehow this space remains dark. The polished black floor is beautiful, but without a contrast to lighten the mood, the scene becomes a muddled mixture of browns and blacks, looking more like a chocolatey candy bar than a clean, open workspace. As you’ll see in the “after” shots, the designers will maintain a strong focus on increasing the amount of light that enters and reflects around the kitchen. Despite being dim, the layout of the old kitchen is convenient and well thought-out. A small central island sits back a few feet from the path between the sink, fridge, and stove, offering a convenient open walkway. In this reno, the layout is mostly preserved, with the cabinetry and large appliances receiving an update. Fresh and bright, the new kitchen offers bold contrasts and crisp edges, bringing the room into the 21st century. The beautiful black of the floor is now mirrored and emphasized in the stark black additions in the room, including the vent fan, cabinet knobs, and glossy island tabletop. The cabinetry that surrounds the window now provides a pure white frame, reflecting rather than absorbing the natural light as it enters the room. The addition of a small plant and artistic plate are just enough to add a splash of colour to the new black and white theme. An array of white cabinets reflect light with their sleek surfaces, but they balance their clean, modern aesthetic with a bit of old-school charm, black knobs sending you back to classic farmhouse kitchen designs (and the addition of a farm sink is an appropriate choice to compliment this classic theme!). 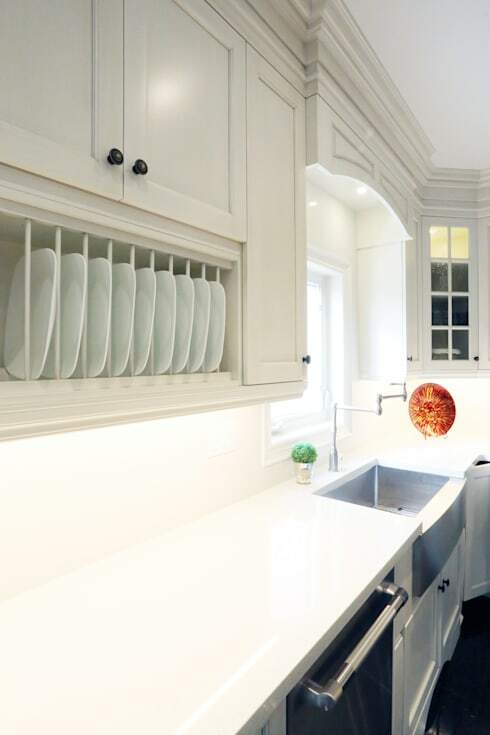 While the old kitchen attempted to create elegance with the addition of large decorative objects, this kitchen creates elegance with a classic colour scheme, high quality materials, and intricate detailing among the layers of white. 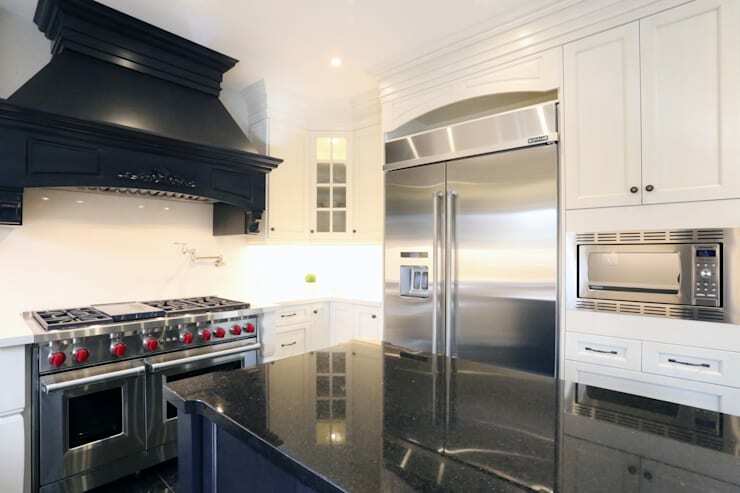 The kitchen maintains a similar placement of large appliances, but the designers have switched out the old ones for new, including this shiny stainless steel double-door fridge. With a six-burner stove just around the corner, this kitchen is now fully prepared for a busy family lifestyle. 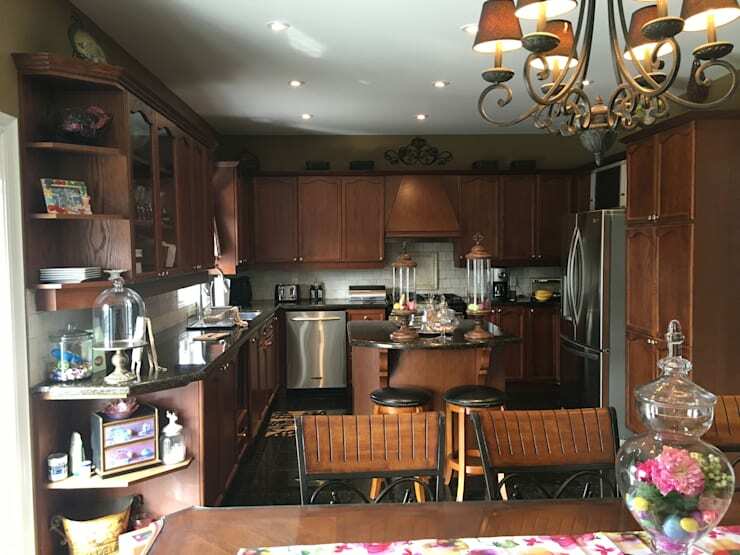 What's your opinion of this kitchen cabinet reno? Comment below!